Would you like to establish an online presence for yourself and/or your business? In 2018 it’s absolutely essential that you do! Whether you’re looking to solidify your brand, make your business more credible, or get more customers and exposure – having a website is the key! The first step towards creating a game-changing website is to register a domain name. It’s your “first impression”. Your URL is the first thing your visitors will see. A good domain name can make a positive and lasting impression while a bad domain name can send visitors running. It defines your brand. Your domain name is a branding opportunity. The right domain name can increase brand recognition. Do you have a domain name in mind? Great! Follow the rest of this post and you’ll have everything you need to successfully register that domain name and build your online presence. Full disclosure: I earn a commission if you end up purchasing any of the domain (and web hosting) services through referral links in this guide. This helps me to keep WebsiteSetup up and running and up-to-date. Thanks for your support. One neat trick that I recommend people to use is to get a web hosting and domain together. To make your website work, you’re going to need both of them. This will also help you save some time and money, a web host often providers provides a FREE domain. So just go ahead and don’t worry about migrating your domain name with your web host. Step 1: Go to GoDaddy.com and type your chosen domain name. 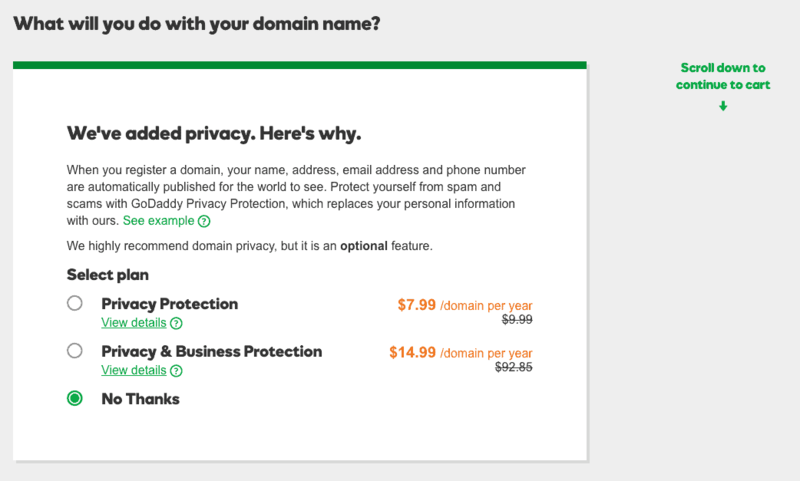 Step 2: When you see that your domain name is available, select the $2.99 option. Then, select “Continue to Cart” on the top right. Step 3: On the next screen, select “No Thanks” under “Select plan”. Step 4: Scroll down and select “Continue with these options”. Step 5: Select the term and proceed to checkout. You can select the term (i.e. the number of years) to register your domain. The longer the term, the cheaper it will be. I recommend doing it for at least two years, as this will save you some money and you won’t have to worry about renewing after the first year. The term length is your choice. If you’re absolutely committed to making your website work over the long term, perhaps you should even select the 5-year term. Either way – once you’ve selected your term, hit the “Proceed to Checkout” button. Then enter your payment details. Just like that, your domain name will officially be registered! 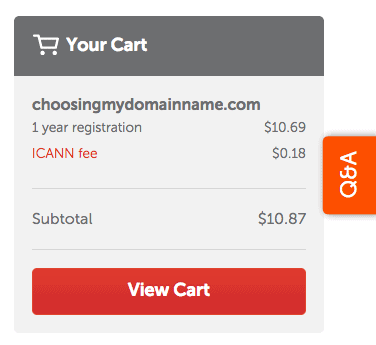 Step 1: Go to NameCheap.com and insert your chosen domain name. Step 2: If your domain name is available, click the add to cart button. Step 3: On the right side of the page, click the “View Cart” button. Step 5: Create an account or log in to your current account. Step 6: Insert the account and payment details, and make the purchase. Once you complete these steps, your domain name will be officially registered! 1. What are Domain Name Extensions? Domain name extensions are categories of internet domain names. But you can be sure of one thing: “.com” is still far and away the best domain name extension. According to research from Registrar Stats, 75% of domains have the “.com” extension, second is “.net” and third is “.org”. “.com” is the most familiar and easiest to remember. My advice is to go with “.com” – it’s the safest bet. If you’re chosen domain name is already taken by a “.com”, you’d be better off choosing a new domain instead of a new domain name extension. 2. What are Most Popular Domain Name Registrars? Domain name registrars are organizations that manage the reservation of internet domain names. You’ll need to use one of these registrars to register your domain name. Now that I’ve covered some of these common questions, let’s talk about how to actually register your domain name. 3. How to Change Domain Name Servers? Domain name servers (DNS) are the internet’s equivalent of a phonebook. To change your nameserver, you must log in to the domain name registrar with whom you registered your domain. Find the DNS manager within your registrar. Locate the DNS that you’d like to change. There will typically be some sort of option like, “Use custom nameservers”. Click that option. Enter your desired new nameserver. Depending on the length of your domain name term, you’ll have to renew your domain name in a year, two years, or longer. It’s crucial that you remember to do so – otherwise, your domain name will go offline. And if you won’t catch on within a few weeks, your domain name will go back up for sale and somebody else can buy it – not good for you! Make a note to renew your domain before it ends. Perhaps a Google calendar reminder or a reminder from your smartphone. Whatever the case, make sure you don’t forget. For some domain name registrars (like the ones we mentioned above), you can set it to automatically renew your domain at the end of its term. This is the safest option – just make sure that you keep your payment information up to date (this can be easy to forget). If you don’t have a website yet, then 2018 is the best time to get started. And the first step to creating your website is to register your domain name. 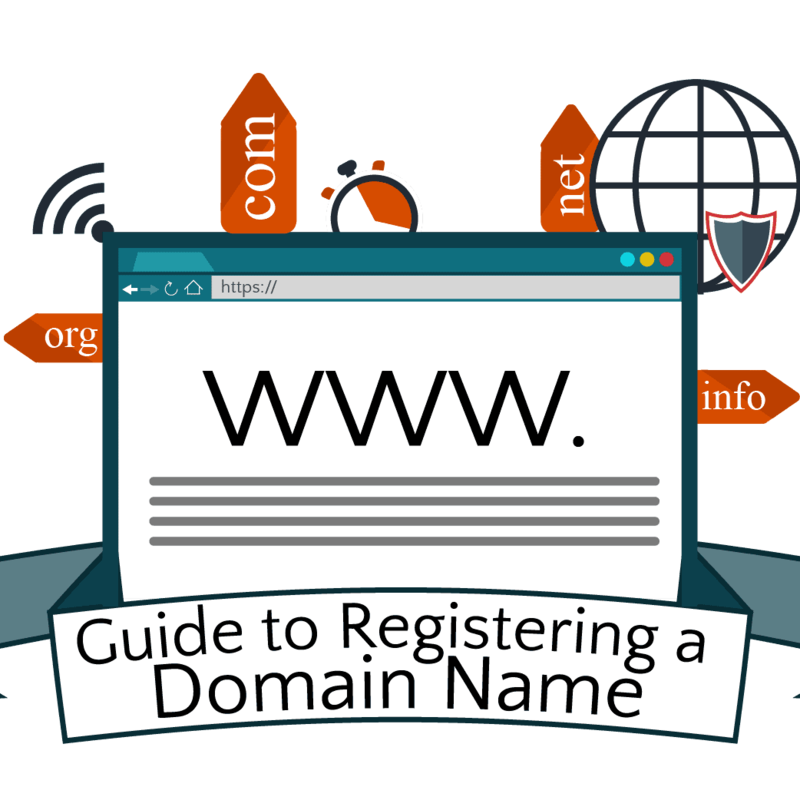 With this simple guide, you can register your domain name quickly and easily. Before you know it, you’ll have your own little piece of the web! If you need a website, read this step-by-step guide here. Robert – Thank you very much for the response! My wife and I are just starting an online business after an injury I had last year. My thought was that I could go back to work way before now. I do not have any experience and do not web hosting is or how it can help me. I realize that to have an online business I need to create a domain name but am not sure how web hosting fits in. Also, I keep hearing about SEO, what tips are there to optimize search engines? Basically the domain name is your unique address and web hosting is what puts your site on the internet for others to access – both are needed. Keep in mind that when you sign up for hosting you get a free domain name as well so there’s no need to buy it separately. Thank you so much for this great information. Couple of questions you may have covered that I did not glean. 1. We would like to sell products on line. Will the website be able to receive orders and payments from potential customers? 2. Does this feature cost more and if so, how much. We are considering Bluehost.com. Hi. I currently have a website on a free website builder (wix). I want to buy my own custom domain, and be able to keep the actual pages I made on the website from wix (its a blog). How would I keep my website and shift it over, and how would I continue to add material (like blogs) if I am no longer on wix’s blog manager? Thank you for sharing! May I ask, for a domain I want, Godaddy asks a low rate for a fixed 2 years contract however Bluehost provides the domain for free if you choose them as a host, then which one would you recommend? Thank you so much for writing this article, suggesting questions or comments and actually proceeding with answering everyone with concise and extremely user friendly info. Originally, I had more questions but your responses and being accountable with your word keeps an article from 2017, up to date ( I hope but feel comfortable with the outcome); therefore I noticed that people are still referring to this article in late 2018 and my own questions are answered and remain to be technology intact in February of 2019. I had to say thank you because its rare that writers on the internet keep up with the progression of their work. Thanks for the kinds words, Chang! I need a website but I have no idea where to start from . Is your domain name portable if you change service providers? I’m starting a non-profit and I want to hold the name, but eventually I will fire someone to do the website development and want them to be able to use the platform they think they can work most effectively in. 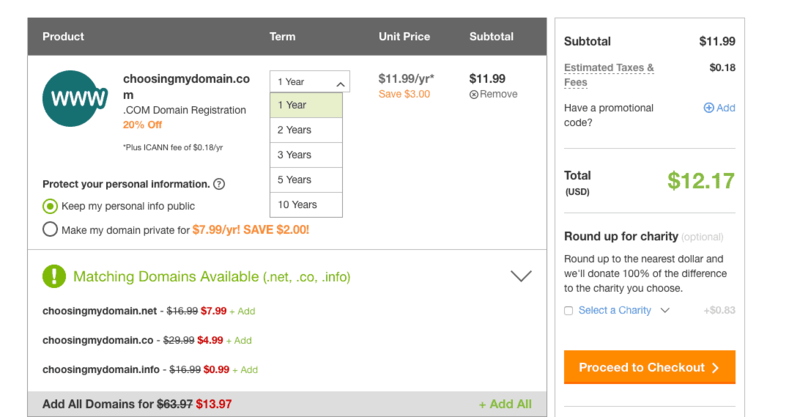 If I were to register with GoDaddy for services and get a free domain name… do I lose it if I switch to another web-hosting provider? Yes, you can move your domain name from one web hosting provider (or registrant) to another. That shouldn’t be an issue :). Hi Robert. Thank you for your website. this is really very helpful for a newbie like me who is planning to do online business. Can I use my name as my domain name ? Can I use same domain name on my other websites? Yes, you can use your name as domain name. And you can create multiple pages/sites on one domain. Hope that helps. Thank you for the information. I wasn’t sure if buying a domain name is the same as registering a domain name. 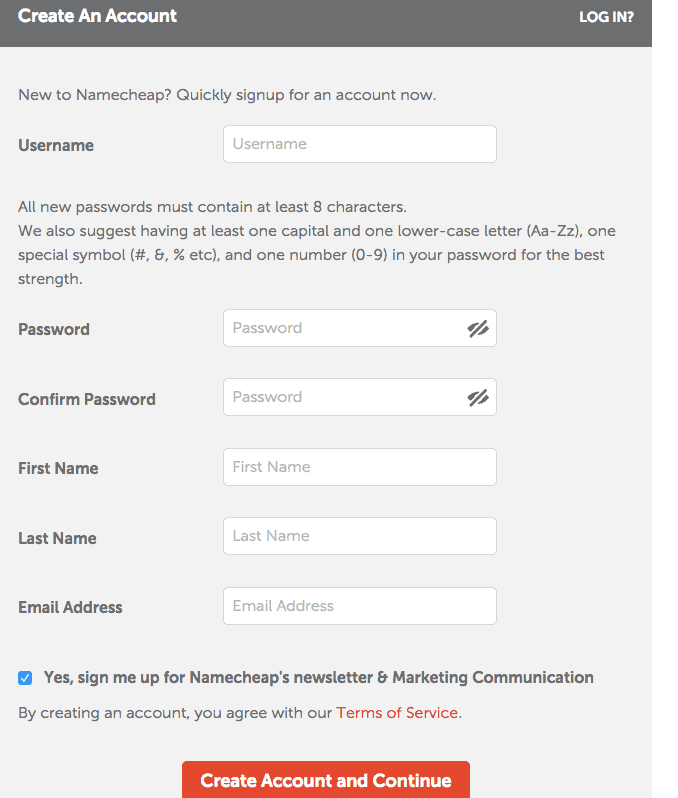 I’m assuming is simultaneous when you buy at one of those websites, like Namecheap. Correct me if I’m wrong. Hi is it possible to keep a website off line until I can complete it? Thanks for the helpful tips 🙂 I already have a web hosting so I just used GoDaddy to register my .com domain name. Thanks for the helpful images – they really helped me to guide through it.